Tirumala, Jan 9 (way2newstv.in):TDD jumped in to perform radhasapthami celebrations in one of the Thirumala celebrations. These celebrations are to be celebrated in Tirumala till the evening of the 24th and early evening. Venkanna Swamy devotees are given a view of the incarnation of SriMilayappa Swami. Every two hours a day on a vehicle is given to the devotees for salvation. The Swami on the day of all the heavy vehicles is processed. T.t.d Barry has been arranging a one-day celebration to be celebrated. 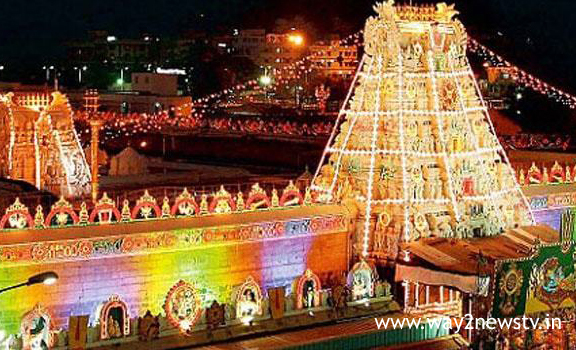 Thousands of devotees come to Tirumala and will participate in this one day Brahmotsavam. From 5.30 am to 7 pm, Swami is a devotee of the devotees of the day. The festivities that started with the Sun Prayer ... take place all day. Smaller Vehicle, Garuda Vehicle, Hanumantha Vehicle, Kalpavriksha Vehicle, All Vehicle Vehicle, Chandra Prabha Vehicle Service Swamy. The cyclonic event is also held in the pushkarani two o'clock in the afternoon. Now the upcoming festivals are likely to be heavily crowded. At the end of last year, Vaikunta Ekadasi celebrations were held in Thirumala. Then many devotees got into trouble. The proper arrangements, or the smell of the Lord, satisfied with the dilemma. One of the first days of this year is the January Paste Day ... It is believed that a large number of devotees are expected to arrive at Radhasapthami celebrations in this context. T.t.d has been making huge arrangements for devotees for devotees. The galleries are being constructed along the Tiruvadi. Swamy is making arrangements to make them go without the throats. There is a shade from the sun, where the sparrows are cut. Steps are being taken to provide a wide range of drinks to the devotees in galleries.